Tonight the National Wrestling Alliance Crowned a new National Heavyweight Champion. The lineage of the title goes back to January 12th, 1980 when Austin Idol became the first man to wear the belt. 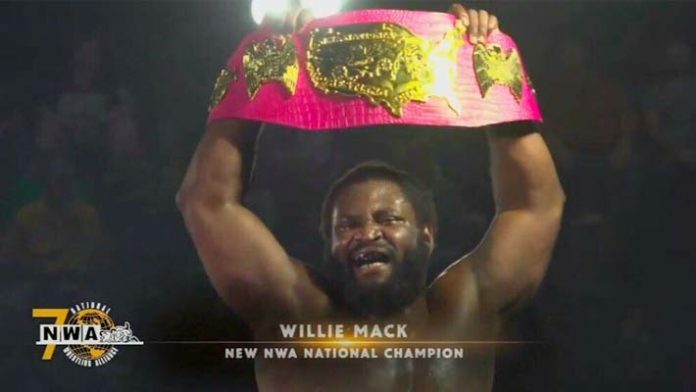 Willie Mack is now the 21st man to wear the gold. He defeated Sam Shaw in the tournament finals after winning a 4-way elimination match earlier on the card. The title win goes along with his HOH Twitch TV title and Lucha Trios championships that he’s won in his career as well. The NWA National title has been held previously by legendary names such as Tully Blanchard, Austin Idol, Ron Garvin, and Ted Dibiase. Sam Shaw won the first semi-final in the tournament. He defeated Colt Cabana, Scorpio Sky, and Sammy Guevara to advance. Mack defeated Jay Bradley, Ricky Starks, and Mike Parrow in the tournament’s second semi-final match. Earlier in the evening, Magnum TA mentioned the new National Champion would be in line to face the NWA World Heavyweight Champion at some point. As we have stated since October 1 Of 2017, we have focused on #TenPoundsOfGold as our primary championship. We are bringing back National Title at #NWA70 show.